Go in pursuit of the Rhino tribe's stolen CHI with Rogon's Rock Flinger! Play Lego Chima Rogons Rock Flinger,have fun! 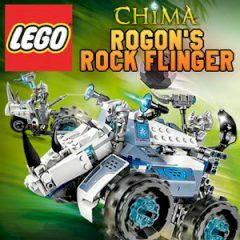 Go in search of Chip stolen by the Rhino tribe in the game Lego Chima Rogons Rock Flinger. Enter your vehicle to fight against Rhino tribe to destroy its entire fleet! You have 5 cars to complete the game. Its main mission is to destroy the Rhino tribe of the base vehicle carrying weapons and soldiers.